The Spirit of Innovation & Drumming is a customizable program of music presentation and education that promotes development and evolution. Each event is led by Master drummer, Paul F. Murphy, and multi-instrumentalist, Dominic Fragman. Together they offer performances, clinics, and workshops that focus on improvisation and innovation in music and drumming. Their methods draw from experience rooted in a lineage of iconic drummers like Louie Bellson and Rashied Ali, to cutting edge fully improvised concerts which have been noted as new direction in jazz and art. Murphy and Fragman specialize in bringing audiences and participants liberation through free expression. When you work with the Spirit of Innovation & Drumming each engagement is tailored for your needs, from single performances to multi-event series. Drum Set Performances - Exhilarating drum set presentations that capture the excitement of old school drum battles, the passing of the torch from master to apprentice, and showcase an evolution of ideas in drumming. Drum & Guitar Performances - The gripping music of Murphy and Fragman with Murphy on drum set and Fragman on guitar. These improvised performances often leave audiences enchanted and intrigued. Drum Set Clinics - Two drum sets, Murphy's revolutionary Wicked Chops Practice Pad by Ahead, and Fragman's Solo Trio (guitar, drums, and vocals simultaneously). Murphy and Fragman's drum set clinics are an exploration of technique and significant styles. They illuminate the process of utilizing these tools for developing unique ideas. Improvisation Workshops - An interactive class designed to help players understand and develop the improvisation process: experience, tradition, craft, and emotion simultaneously becoming action. Murphy and Fragman discuss and demonstrate the path to seamless transmission of thought to expression through improvisation which facilitates strong, fresh composition. The Mindset of Innovation - Each Spirit of Innovation & Drumming event is geared towards providing an understanding of personal style and concept. The mindset of innovation fuels every performance and educational situation. Murphy and Fragman help illuminate this process: the identification and study of masterworks, stylistic and conceptual innovations, understanding the position of the collective towards new ideas. Sharing these concepts is integral to the extrapolation of personal potential and realizing one's own ability to innovate. Percussionist, bandleader, and composer Paul Murphy began playing drums as a child. He was befriended by Gene Krupa at age six and later studied with Louis Bellson. He also worked under the tutelage of Joseph Leavitt, the director of percussion at the Peabody Conservatory and the principal percussionist of the National Symphony Orchestra. By age 16 he was performing regularly with Duke Ellington's bass player Billy Taylor. In 1970 Murphy relocated to San Francisco and established himself as a bandleader in such jazz venues as Keystone Korner. After meeting Cecil Taylor and his longtime alto saxophonist Jimmy Lyons in San Francisco, Murphy moved to New York. There he managed Rashied Ali’s club, Ali’s Alley, and became Lyons’s first-choice drummer until the saxophonist’s death in 1986. During the 1980s Murphy led recording dates at CBS and RCA with a band that included Mary Anne Driscoll, Karen Borca, Lyons and Dewey Johnson. He has subsequently collaborated with renowned pianist Larry Willis and poet Jere Carroll, performing works that link the worlds of bebop and the avant garde and that have been noted as a new direction in the jazz and art arena. In addition to leading pioneering recordings and ensembles, Murphy is renowned for his innovative approach to the drum set. He is a fluent, compositionally minded master drummer and has performed with numerous musicians across a vast spectrum of genres. Murphy’s biography is included in Oxford University Press’s Grove Dictionary of American Music (2013). 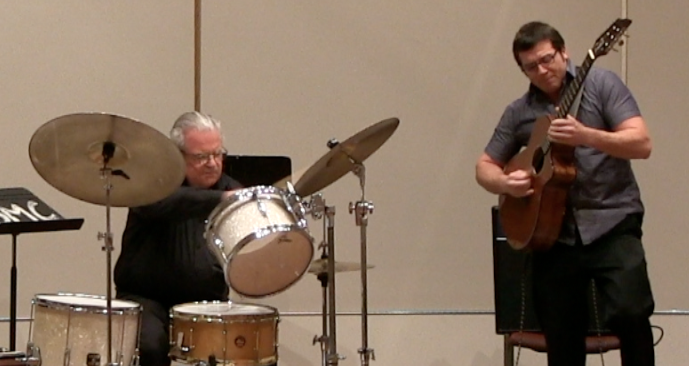 A perpetual student of the arts, Dominic Fragman, studies drumming and composition under master drummer Paul F. Murphy. He has also studied and performed with iconic pianist and MacArthur Fellow Cecil Taylor, and with renowned bebop pianist Larry Willis. 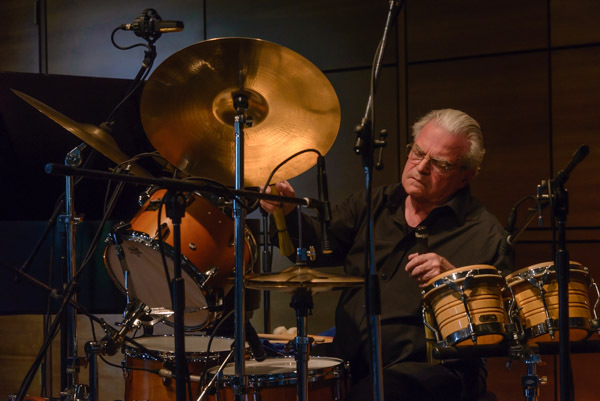 Fragman's lineage through these musicians links to Gene Krupa, Louie Bellson, Buddy Rich, Duke Ellington, and Miles Davis. In 2013, Oxford University Press invited Fragman to author an entry on Paul Murphy for the Grove Dictionary of American Music. Fragman is also a simultaneous multi-instrumentalist who performs on guitar, drum set, and vocals at the same time. His performances are all live, no looping—a presentation method he’s dubbed the Solo Trio. He uses rock music as a foundation for intense, captivating songs interweaved by exhilarating improvisations drawing from African, Brazilian, Eastern, and jazz influences. What’s Up magazine described Fragman as “the next generation of trailblazing drummers [who] pushes the boundaries of rhythm exploring music from all angles with his instrument and free spirit.” Fragman released his debut EP, Obsonatus, in April 2017. Fragman’s primary instrument is drum set. He has performed throughout the US and Europe with artists ranging from Top 40 to free jazz, including Jimi "Haha" Davies, Charles Gayle, James Brandon Lewis, and William Parker. He has played the Jazz and Wine of Peace Festival, Salerno Jazz Festival, So What's Next Festival, and the Jamboree Jazz Club Festival. He has performed as the Solo Trio on the National Mall for the DC Rally 4 Refugees, at FloydFest, The Annapolis Fringe Festival, Rams On Stage and Rams Head Live. He is a Regal Tip Sticks, Wicked Chops, Booty Shakers, and Ahead Artist. Fragman is co-founder with Paul Murphy of The Spirit of Jazz & Democracy, a program he began researching and developing as his senior honors thesis at St. Mary’s College. Subsequently, as an independent scholar and active clinician focusing on composition, improvisation and innovation, he partnered with Murphy and philosopher Sybol Anderson to expand the program into a series of lectures, concerts, workshops, and master classes. Louie Bellson asked Murphy to be the premier soloist of a group of drummers at his 1992 wedding. Left to Right: Francine Bellson, Louie Bellson, Paul F. Murphy, Eddie Gale. Are you interested in hosting or learning more about the Spirit of Innovation & Drumming? Would you like to ask questions or request more information? Please feel free to contact us through the email below. We look forward to hearing from you and will be in touch as soon as possible. Thank you!